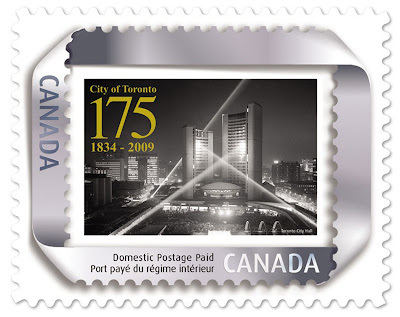 Toronto is releasing a stamp to commemorate its 175 years as a city! They'll be given out for free at the Cavalcade of Lights and at Toronto Museums in late November and early December. I think this is pretty cool. The stamp also looks pretty awesome. I want one. Happy birthday Toronto! Posted by Andrew at 2:12 p.m.